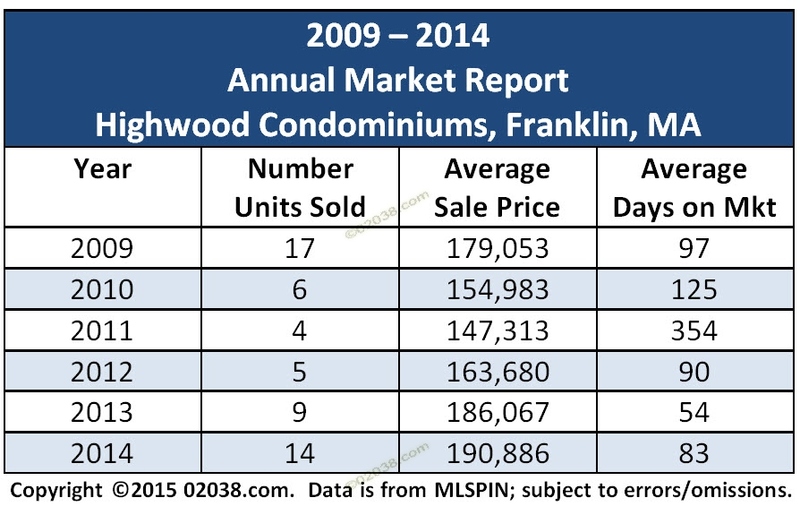 The Highwood condominium community in Franklin, MA continued to enjoy rising prices and increasing sales volume in 2014. For the third year in a row, Highwood’s average sales price moved higher and the number of units sold went up. 2014’s average sales price of $190,886 is 2.9 % higher than the previous year’s. The gain was modest but comes on the heels of an over 13% price increase in 2013 and an 11% rise in 2012. 2014’s average sales price at Highwood is nearly 30% higher than the price low set at Highwood back in 2011! The rising prices and increasing sales volume at Highwood in 2014 came amid an economic trifecta on the national level of a rapidly growing economy, collapsing oil prices and historically low mortgage rates. If these favorable factors continue in 2015, you may see demand for homes across Massachusetts strengthen. 2015 may be a great year to buy a home or investment property in the Bay State! 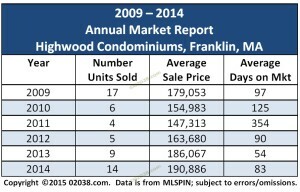 If you’re thinking of buying a condo in 2015, consider Highwood in Franklin! You can learn more about this popular condominium community in Franklin in this post below. Follow the link to download the complete 2014 Highwood market report. It shows all sales at Highwood in Franklin, Massachusetts for 2014 with lots of photos and facts! Or you can tap (or click) the image below to access the report. The Highwood condo community in Franklin, Massachusetts is a wonderful place to call home! Built in three phases, the community offers delightfully distinct architecture and floor plans. Phase I employs brick construction. Phase II enjoys an attractive Tudor facade. Phase III consists of vinyl-sided townhomes, some with basements! Highwood has a super location near a wide-array of shopping and services. I-495 is just a short drive away.